We are a leading Manufacturer of rib belt, clavicle brace, arm sling, taylor brace, universal shoulder immobilizer and cast shoe from Rohtak, India. We as an acclaimed company, engaged in offering a comprehensive variety of Rib Belt. 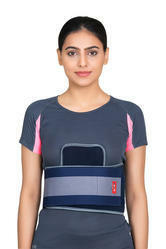 This belt provides adequate support to the rib cage in injuries like dislocation or fracture. Offered array is available in universal size & can be worn easily by both males & females. This range is designed by our experts using the best quality material. Clients can purchase the entire range at affordable prices. 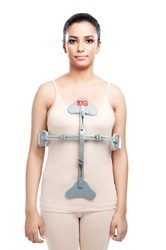 With the wide experience and vast knowledge of our company, we are offering an encompassing range of Clavicle Brace. The offered brace provides support to the clavicle injuries. This brace has unique strap design & extra foam padding that offers utmost comfort to the patient. Offered brace is demanded mostly for its features. Provided brace is obtainable in various specifications as per the need of our clients. We are the dynamic, business-oriented organization, ranking among the utmost entities in providing a wide assortment of Arm Sling. 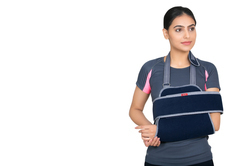 This sling provides a comfortable protection to the fractured arm, while the arm recuperates. 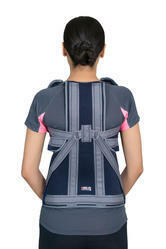 Adjustable foam padding of this sling reduces pressure on shoulders & neck. The offered sling is distinguished in the market for its exceptional features. Our sling is intricately designed keeping in mind the comfort of patients. 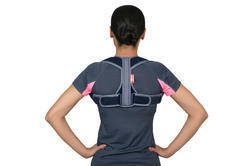 Taylor Brace/Back Support Brace immobilizes the Dorsolumbar & Sacral region and keeps spine in neutral position. The high strength aluminium splints enhances the immobilization & quickens the healing. Universal Shoulder Immobilizer provides support to the dislocated shoulder and immobilizes the fractured region of shoulder joint & clavicle bone. 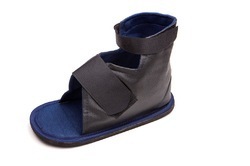 Cast Shoe is designed to provide protection to the fractured foot. Made from a lightweight & water-proof material, it prevents soiling of plaster. Having a definite quality management system, we are regarded as the noteworthy firm of Elastic Shoulder Immobilizer. This product provides immobilization in shoulder dislocation and post-operative rehabilitation. It has the elastic belt & buckled grips that immobilize the injured arm. Offered shoulder immobilizer can be fit either to left/right arm. The offered range is designed using contemporary machines. 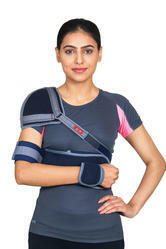 On varied parameters, this shoulder immobilizer is checked by our adept professionals. Stripes & Check Sling provides a comfortable protection to the fractured arm, while the arm recuperates. The adjustable foam padding reduces pressure on shoulders & neck. We are offering Ash Brace to our client.